Vintage - Maling-New Castle, Lustreware, Rounded Oval, Serving Dish, Hand Painted, Circa 1950-1955. A beautiful Vintage, Pink Lustreware, Rounded Oval Serving Dish, in the "Azalea Rose" Pattern #6598 by Maling-Newcastle on the Tyne. 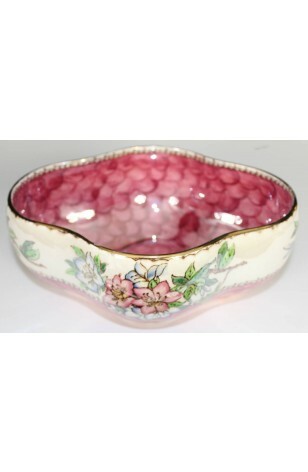 This is a fantastic Hand painted Thumbprint Pattern in the Center of the Dish, in Pink. Has a Rope Verge, Outer Band in Cream, with Floral Bouquet, Black Scallop on Edge and Gold Rim. Dish has 2 small chips on the inside Rim (see picture). Otherwise, a beautiful, and usable serving dish.. Very Decorative.